Ethiopians in Washington are expected to turn out in large numbers Thursday to greet Prime Minister Abiy Ahmed, who is making his first U.S. visit after instituting a series of transformative reforms in his homeland. Upon arriving in Washington, Ethiopia’s foreign minister, Workneh Gebeyehu, said the delegation’s trip was historic. 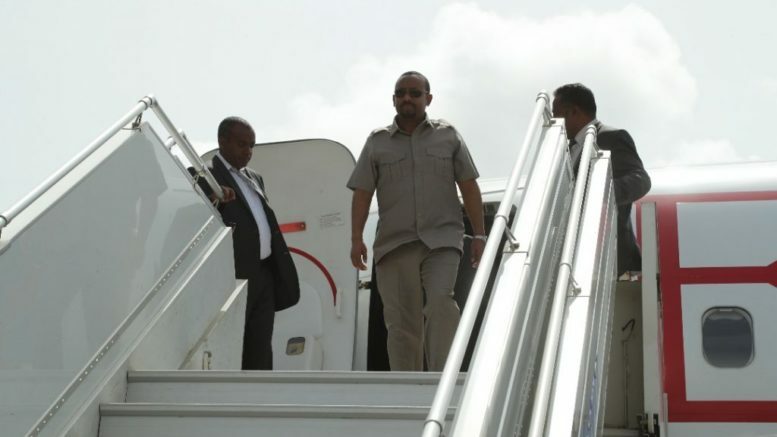 “This is the first-ever visit by [an] Ethiopian prime minister to visit diaspora Ethiopians … we are so excited,” Workneh told a VOA Amharic reporter at Dulles International Airport. Earlier this year, Ethiopia faced widespread unrest and violent protests against a government that appeared unresponsive and entrenched. In less than four months in office, Abiy has led a dramatic turnaround. Sweeping reforms have quelled dissent, boosted civil liberties and begun to heal wounds from decades of ethnic tension and marginalization. Abiy was elected by the ruling coalition’s executive council after his predecessor, Hailemariam Desalegn, abruptly resigned. Since assuming office, Abiy has focused on improving human rights, reducing corruption, and introducing economic and political reforms that can potentially move Ethiopia toward a more democratic society. Now, Abiy is connecting with Ethiopians in the U.S. to promote his reforms and encourage diasporans to return home and add to the changes unfolding. Eritrean President Isaias Afwerki and Ethiopian Prime Minister Abiy Ahmed walk together at Asmara International Airport, Eritrea, July 9, 2018. A peace deal between the East African neighbors garnered international commendations. For a country that’s seen some of its most talented doctors, academics and engineers leave for better opportunities in Europe and the U.S., a return of diasporans could affect whether Ethiopia’s reforms stick. NuNu Wako is a media spokesperson for the prime minister’s visit to Washington, organized by the Ethiopian Embassy. She told VOA that Abiy’s trip is designed to “bridge the gap” between the Ethiopian government and American diaspora communities in ways not seen in the past 27 years, since Ethiopia’s current government toppled the communist regime that preceded it. In Washington, Abiy plans to meet with representatives from academia, banking, medicine and other industries with prominent Ethiopians. He hopes some will return home. “It’s really important that these powerful brains are returned to Ethiopia and assist in the sustainable development of Ethiopia,” Wako said. Ethiopians rally in solidarity with Prime Minister Abiy Ahmed, whose photo is seen on a participant’s T-shirt, in Meskel Square in the capital, Addis Ababa, Ethiopia, June 23, 2018. Abiy has led a broad set of reforms since assuming office in April. In his first 100 days in office, Abiy has introduced symbolic and substantive changes designed to reshape Ethiopia and the broader region. He has closed prisons, released hundreds of political prisoners and admitted that the government has tortured its citizens. He has also unblocked opposition media that was previously banned and taken steps to privatize key industries. In June, Abiy said Ethiopia would honor the terms of an international ruling and cede land back to its neighbor Eritrea, leading to a historic peace deal weeks later and the end of nearly two decades of cold war between the countries. Abiy’s push to open up Ethiopia’s political system reached a “critical turning point” earlier this week, Wako said, when he called for multiparty democracy. Ethiopia’s politics are based on ethnic federalism. Its regions and accompanying political parties are largely defined along ethnic lines. Four parties make up the country’s ruling coalition, the Ethiopian People’s Revolutionary Democratic Front, and they have a virtual monopoly on political power. But Ethiopia has more than 80 ethnic groups, and the current system has led to the consolidation of power into the hands of a few. Moving toward a multiparty system could lead to more inclusive politics that benefit all of society, Wako said. FILE – People gather to receive food at a distribution site in Farbudo, a camp for internally displaced people, in Gode, near Kebri Dahar, southeastern Ethiopia, Jan. 27, 2018. Nearly a million people have been displaced in southern Ethiopia due to ethnic violence. Ethiopia’s reforms could lead to deeper ties to the U.S.
Michael Raynor, the U.S. ambassador to Ethiopia, spoke to VOA’s Amharic Service and said the U.S. looks forward to expanding its long-standing relationship with Ethiopia in light of the “extraordinary range of initiatives” introduced by Abiy. That could entail more development assistance, security partnerships and governance programs. “I think, with the reforms to the business climate that the prime minister and the government are planning, that will create wonderful opportunities for U.S. commercial engagement as well,” Raynor said. Not everyone is enthusiastic about Abiy’s overseas trip. Mesfin Woldemariam is a retired professor and the founder of the Ethiopian Human Rights Council. He told Ethiopian broadcaster LTV that Abiy should address pressing domestic concerns before looking outward. “While there is fire burning within the country from four different directions, the prime minister is going to a different country. I don’t know what he is going to find or what he is looking for there,” Mesfin said. Engaging with the diaspora may not bring the benefits Abiy hopes to reap, he added, until the country becomes more stable over time. “The diaspora can come back with their own will, and we shouldn’t placate them — especially when things haven’t firmed up within Ethiopia yet,” Mesfin said. Among the problems Abiy faces at home is the displacement of nearly 1 million people in the southern Gedeo and West Guji zones because of ethnic violence. The humanitarian crisis has escalated since Abiy took office in April, and hundreds of thousands of people are in need of emergency aid. In the U.S., Ethiopians are the second-largest group of African immigrants, trailing only Nigerians. In 2014, a quarter-million first- and second-generation Ethiopians lived in America, according to a report compiled by the Migration Policy Institute. Most Ethiopian immigrants arrived in the U.S. in the past two decades. After meeting with prominent businesses, religious leaders and political groups in Washington, Abiy will visit diaspora communities in Minneapolis and Los Angeles.